At no time in history has it become more apparent that we are in the final days before Jesus Christ's return than today. Recent events--from the devastating earthquakes in Haiti and the Philippines, to the collapse of the housing market, to the record-breaking unemployment rates and increased homelessness of individuals and families, to the never-ending threat of terrorism--all seem to confirm this. 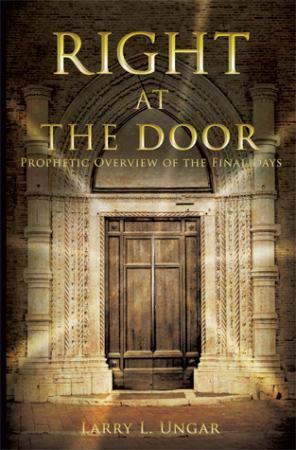 Xulon Press author Larry L. Ungar's Right at the Door: Prophetic Overview of the Final Days ($18.99, paperback, 978-1-61579-421-8; $28.99, hardcover, 978-1-61579-758-5) will assure readers that although the final days are here, grace abounds and the gift of salvation remains available to all. Through the revelations of God's Word, the author reveals His plan for these final days and a timeframe for Jesus' long-awaited return. "There is much comfort in knowing God has not left us alone and blind to the future," the author says. "God--with His infinite grace, mercy, and love--has provided the reader with the opportunity to be prepared for the days ahead. The proof of this is in the sixteen prophecies discussed in depth in this book. These sixteen prophecies found in the Bible speak specifically to the days in which we live, and the limited time in which we have to live them." Ungar had been writing this book for a number of years, but he knew from the very beginning that this was God's book and he was His instrument. In retrospect, he now sees that God is going to use this book in a mighty way in the lives of readers--much more so than had it been published before He was ready. "With each prophecy, God revealed to me His heart--that His creation [may] know Him, trust Him, and receive His love for them," the author explains. "It is my sincere prayer that the readers begin to know God, trust God, and receive God's love for them." Xulon Press, a division of Salem Communications, is the world's largest Christian publisher, with more than 7,000 titles published to date. Retailers may order Right at the Door through Ingram Book Company and/or Spring Arbor Book Distributors. Right at the Door is available online through xulonpress.com/bookstore, amazon.com, and barnesandnoble.com.